An Oriental rabbinical family, probably of Spanish origin, members of which are found in Spain, and in Smyrna, Alexandria, and other cities of the East; their pedigree, however, can not be traced further back than the eighteenth century. The name is undoubtedly derived from the office of ḥazzan, which one of the ancestors of the family held. Brother of Elijah Bekor Hazan; born at Smyrna 1848. In 1871 he founded the Judæo-Spanish periodical "La Esperanza," subsequently called "La Buena Esperanza"; he also wrote two novels from Jewish life: "Rahel en el Convento" and "El Muchacho Abandonado." Aaron Hazan celebrated the twenty-fifth anniversary of his paper by issuing an "edition especial" (Smyrna, 1896), containing a history of the congregation of Smyrna during the quarter-century. In 1890 he was decorated with the Order of the Nishan-i-Medjidie. Writer of devotional hymns; flourished about the middle of the thirteenth century. His piyyuṭim are found in the Sephardic, the Italian, the Algerian, and even the Karaitic rituals. Best known is his AḤot ḲeṬannah, a hymn for New-Year, which has been included in the devotional "Liḳḳuṭe Ẓebi" and translated into German. Landshuth, 'Ammude ha-'Abodah, i. 11 et seq. Lived in Jerusalem about the middle of the eighteenth century. He wrote: "Ḥozeh Dawid," a commentary on the Psalms (Amsterdam, 1724); "Ḳohelet ben Dawid," on Ecclesiastes, with "Dawid ba-Meẓudah," on Abot (Salonica, 1748); and "Aggan ha-Sahar," on Proverbs (ib. 1749). Steinschneider, Cat. Bodl. col. 858. Flourished in Palestine toward the end of the eighteenth century. He wrote: "Miktam le-Dawid," responsa and novellæ on Maimonides (Leghorn, 1792); and "Ḳodshe Dawid," annotations to the laws on holy days in the Shulḥan 'Aruk (ib. 1792). The latter was intended as the first part of a larger work to be entitled "Ḥasde Dawid," which, however, was not published. Nepi-Ghirondi, Toledot Gedole Yisrael, p. 77. Chief rabbi of Alexandria (1903); born at Smyrna in 1840. He went to Jerusalem with his grandfather, Ḥayyim David Hazan, in 1855. He was successively clerk of the Jerusalem congregation (1866) and member of the rabbinical college (1868). In 1871 he was appointed solicitor of alms for Palestine; in 1874 he was electedrabbi of Tripoli, whence he was called to Alexandria in 1888. In 1903 he presided over the Orthodox rabbinical convention at Cracow. Elijah Hazan is a representative of strict Orthodoxy. He has published: "Ṭob Leb," homilies printed together with his grandfather's "Yiṭab Leb" (Smyrna, 1868); notes to his grandfather's "Yishre Leb" (ib. 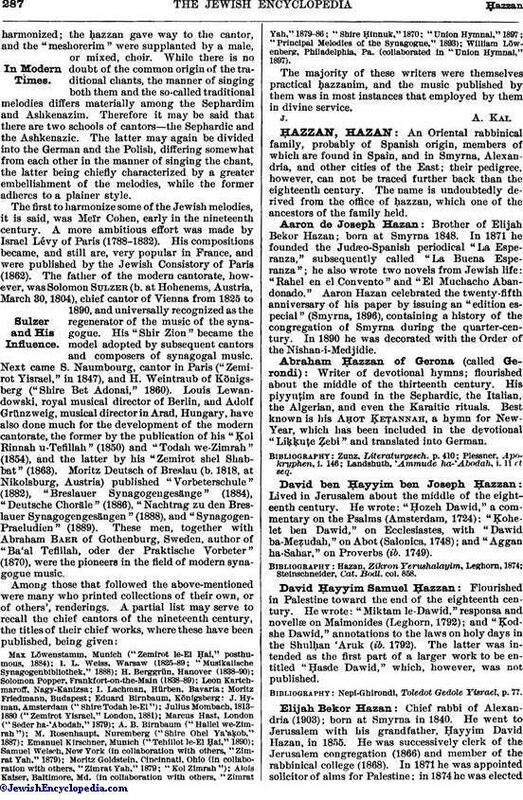 1870); "Ḳonṭres Yismaḥ Mosheh," a decision on the will of the famous philanthropist Ḳa'id Nissim Shamama (Leghorn, 1874; Italian transl., 1877); "Zikron Yerushalayim" (ib. 1874); "Ta'alumot Leb," responsa (1st part, ib. 1877; 2d part, ib. 1893; 3d part, Alexandria, 1902); "Neweh Shalom," on the religious customs of Alexandria (ib. 1894). "Zikron Yerushalayim" is an apology for Judaism in the form of a dialogue between a Palestinian rabbi and the members of the family of a pious Mæcenas in Tunis. The author defends the strictest Orthodoxy, insists on the sacredness of the second holy days, and denies the truth of the Copernican system; in an appendix he gives valuable notes on the Ḥazzan family. Many of his works are still in manuscript. Son of Joseph ben Ḥayyim Hazan; rabbinical scholar of the nineteenth century. He wrote "Oraḥ Mishpaṭ," notes on Ḥoshen Mishpaṭ (Salonica, 1858). Some of his responsa are found in the collection of his father; others, a volume of homilies, and novellæ to Hai Gaon's "Miḳḳaḥ u-Mimkar" are in manuscript. Elijah Hazan, Zikron Yerushalayim, p. 131, Leghorn, 1874. Son of Joseph ben Ḥayyim Hazan; born at Smyrna Oct. 9, 1790; died at Jerusalem Jan. 17, 1869. He was one of the leading Talmudists of his age. In 1840 he was appointed chief rabbi of Smyrna; in 1855 he went to Jerusalem, where he was made ḥakam bashi in 1861. In allusion to his initials, , he was called ("without equal in his generation"). He wrote: "Torat ha-Zebaḥ," on the laws of ritual slaughter (Salonica, 1852; reprinted, Jerusalem, 1883); "Nedib Leb," responsa (1st part, Salonica, 1862; 2d part, Jerusalem, 1866); "Yiṭab Leb," sermons (Smyrna, 1868); "Yishre Leb," halakic discussions, with additions by his grandson, Elijah Bekor Hazan (ib. 1870). 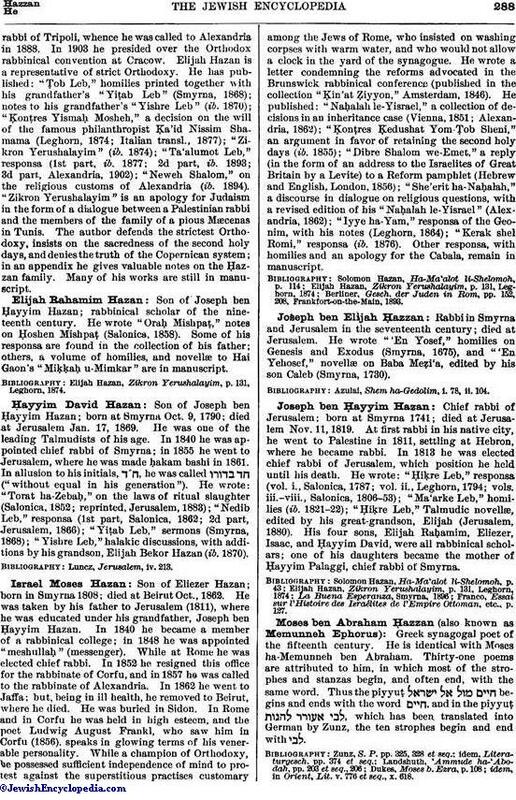 Son of Eliezer Hazan; born in Smyrna 1808; died at Beirut Oct., 1862. 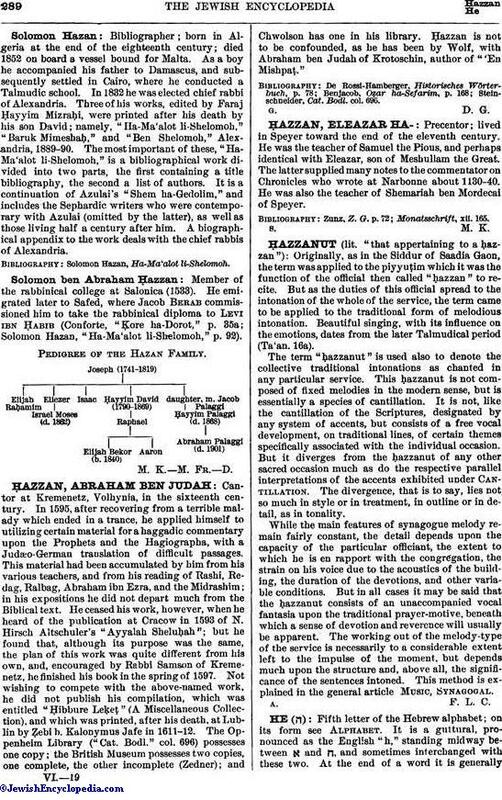 He was taken by his father to Jerusalem (1811), where he was educated under his grandfather, Joseph ben Ḥayyim Hazan. In 1840 he became a member of a rabbinical college; in 1848 he was appointed "meshullaḥ" (messenger). While at Rome he was elected chief rabbi. In 1852 he resigned this office for the rabbinate of Corfu, and in 1857 he was called to the rabbinate of Alexandria. In 1862 he went to Jaffa; but, being in ill health, he removed to Beirut, where he died. He was buried in Sidon. In Rome and in Corfu he was held in high esteem, and the poet Ludwig August Frankl, who saw him in Corfu (1856), speaks in glowing terms of his venerable personality. While a champion of Orthodoxy, he possessed sufficient independence of mind to protest against the superstitious practises customary among the Jews of Rome, who insisted on washing corpses with warm water, and who would not allow a clock in the yard of the synagogue. He wrote a letter condemning the reforms advocated in the Brunswick rabbinical conference (published in the collection "Ḳin'at Ẓiyyon," Amsterdam, 1846). He published: "Naḥalah le-Yisrael," a collection of decisions in an inheritance case (Vienna, 1851; Alexandria, 1862); "Ḳonṭres Ḳedushat Yom-Ṭob Sheni," an argument in favor of retaining the second holy days (ib. 1855); "Dibre Shalom we-Emet," a reply (in the form of an address to the Israelites of Great Britain by a Levite) to a Reform pamphlet (Hebrew and English, London, 1856); "She'erit ha-Naḥalah," a discourse in dialogue on religious questions, with a revised edition of his "Naḥalah le-Yisrael" (Alexandria, 1862); "Iyye ha-Yam," responsa of the Geonim, with his notes (Leghorn, 1864); "Kerak shel Romi," responsa (ib. 1876). Other responsa, with homilies and an apology for the Cabala, remain in manuscript. Berliner, Gesch. der Juden in Rom, pp. 152, 208, Frankfort-on-the-Main, 1893. Rabbiin Smyrna and Jerusalem in the seventeenth century; died at Jerusalem. He wrote "'En Yosef," homilies on Genesis and Exodus (Smyrna, 1675), and "'En Yehosef," novellæ on Baba Meẓi'a, edited by his son Caleb (Smyrna, 1730). Azulai, Shem ha-Gedolim, i. 78, ii. 104. Chief rabbi of Jerusalem; born at Smyrna 1741; died at Jerusalem Nov. 11, 1819. At first rabbi in his native city, he went to Palestine in 1811, settling at Hebron, where he became rabbi. In 1813 he was elected chief rabbi of Jerusalem, which position he held until his death. He wrote: "Ḥiḳre Leb," responsa (vol. i., Salonica, 1787; vol. ii., Leghorn, 1794; vols. iii.-viii., Salonica, 1806-53); "Ma'arke Leb," homilies (ib. 1821-22); "Ḥiḳre Leb," Talmudic novellæ, edited by his great-grandson, Elijah (Jerusalem, 1880). His four sons, Elijah Raḥamim, Eliezer, Isaac, and Ḥayyim David, were all rabbinical scholars; one of his daughters became the mother of Ḥayyim Palaggi, chief rabbi of Smyrna. Franco, Essai sur l'Histoire des Israélites de l'Empire Ottoman, etc., p. 127. Greek synagogal poet of the fifteenth century. He is identical with Moses ha-Memunneh ben Abraham. Thirty-one poems are attributed to him, in which most of the strophes and stanzas begin, and often end, with the same word. Thus the piyyuṭ begins and ends with the word , and in the piyyuṭ , which has been translated into German by Zunz, the ten strophes begin and end with . idem, in Orient, Lit. v. 776 et seq., x. 618. Bibliographer; born in Algeria at the end of the eighteenth century; died 1852 on board a vessel bound for Malta. As a boy he accompanied his father to Damascus, and subsequently settled in Cairo, where he conducted a Talmudic school. In 1832 he was elected chief rabbi of Alexandria. Three of his works, edited by Faraj Ḥayyim Mizraḥi, were printed after his death by his son David; namely, "Ha-Ma'alot li-Shelomoh," "Baruk Mimeshaḥ," and "Ben Shelomoh," Alexandria, 1889-90. The most important of these, "Ha-Ma'alot li-Shelomoh," is a bibliographical work divided into two parts, the first containing a title bibliography, the second a list of authors. It is a continuation of Azulai's "Shem ha-Gedolim," and includes the Sephardic writers who were contemporary with Azulai (omitted by the latter), as well as those living half a century after him. A biographical appendix to the work deals with the chief rabbis of Alexandria. Member of the rabbinical college at Salonica (1533). He emigrated later to Safed, where Jacob Berab commissioned him to take the rabbinical diploma to Levi ibn Ḥabib (Conforte, "Ḳore ha-Dorot," p. 35a; Solomon Hazan, "Ha-Ma'alot li-Shelomoh," p. 92). Pedigree of the Hazan Family. M. K. M. Fr. D.